My father died on Ash Wednesday (February 18, 2015). 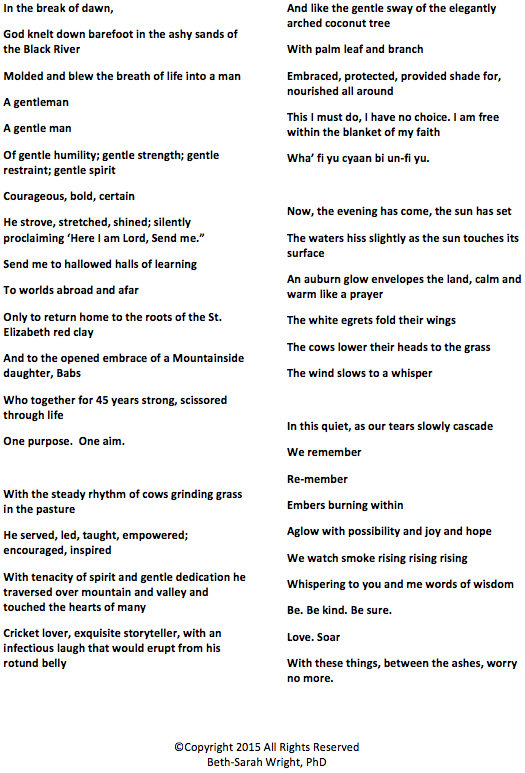 I wrote this poem in his honor at the celebration of his life on February 28. I have many memories of my father. But in the last days as he made his journey home, I have two new very cherished ones. First, as his faculties diminished and he could barely speak or respond, he remained crystal clear about 3 things: his name, his wife’s name and the Lord’s Prayer which he would spontaneously utter. And secondly, on Ash Wednesday I was privileged- after having received my own ashes in the hospital chapel that late afternoon- to take the ashes from my forehead, and put on my mother’s who never left my father’s side, and my father’s as he took his last few breaths. And I repeated the words, “Remember we are dust and to dust we must return.” Ashes to Ashes. I feel he would have comforted me by saying that what really is important is what happens between the ashes.